Maxi-Flex means maximum flexible led-cards which you can bend convex, concave, even twisted to realize new forms of led-displays. To create innovative displays we can offer this new version with 10mm and 6mm physical pixel-pitch. SMD 3in1 leds used, for indoor installation. Maxi-Flex led-cards are just 12 mm thin. Due to their low weight of just three kg per m² it´s possible to fix them solid by integrated magnet clamps. We will be happy to consult with you in person! Maxi-Flex system is perfect for creative display solutions: circular, curved or wavy, there are virtually no limits to your imagination. The installation is very easy with our rubber magnetic led-card solution. No screws will needed to fix the led-pixelcards on your steel-underconstruction. Power supplies can be situated up to a few meters away. Our flexible led-screens are working like a flat videowall. Means the led-display will be connected via CAT5 cable with the DVI-interface of your player-pc, that´s all. Everything what you can show on your pc-monitor, you can then also show on your creative led-display. 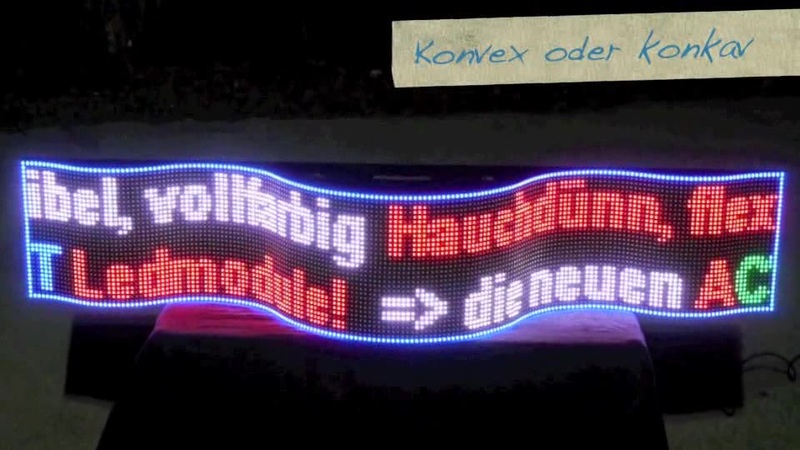 New flexible led pixelcards means a lot of new possiblities for led-screens. Inform us about your ideas and we will try to find the right solution to form your concept.